You are currently browsing the Western Custom blog archives for September, 2009. Monograms have a rich history; probably dating back to the time of the ancient Greeks and before. The actual definition of a monogram is a symbol made by the overlapping or combining of two or more letters. They can be made into recognizable logos and trademarks. Individual letter, or combined letter monograms give a personalized touch to items such as luggage, clothing, etc. 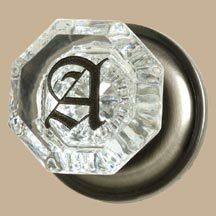 Personalized Doorknobs are an extension of personality and pride associated with home ownership, name, family, or organization. In a home they could be used to differentiate one’s room or space; or just add a personal identifying touch to the whole room motif. Another creative use might be a coat rack w/ knobs used as hangers personalized with each family member’s initials. There are probably many possibilities for these, left only to one’s imagination. Western Custom social media advertising by iePlexus.com.